The What: CADAC's CDC six digital live sound production console is based around a further development of CADAC's advanced gesture-operation user interface. With the same audio performance and low latency of the CDC eight, the CDC six represents a major ergonomic advance in user operation. The traditional fixed physical controls have been replaced by an intuitive high agility user interface, accessed via a 16:9, 23.5 inch optically bonded touch screen, resulting in a fast, logical workflow without the compromises dictated by hardware-centric designs. 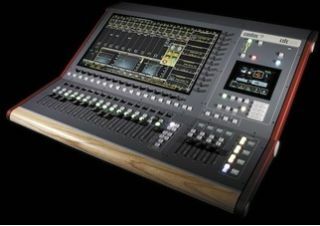 The What Else: The layout of the screen, encoders and OLEDS naturally leads to an instinctive use of touch and swipe, where the faders follow the swipe of the screen, ensuring full control at all time of any combination of inputs, outputs or VCAs displayed on the screen. The CDC six features 64 input channels, 48 assignable busses (as Group, Stereo Group, Aux, Stereo Aux or Matrix plus LCR, Monitors and Talkback) and 20 touch sensitive motorized faders. Both the CDC six and flagship CDC eight are preconfigured with an integrated 64 x 64 Waves card for direct multitrack recording to a laptop and connection to any Waves MultiRack SoundGrid server. Superb audio performance is provided as standard, thanks to the CDC six's legendary CADAC mic pre amps, and incredible sub 0.4 millisecond latency from analogue inputs on stage, through the CDC six's processing, to analogue outputs on stage.